Growing up, Rob Kaminsky knew baseball was his passion. At the age of four he began playing with his older brother’s REC team. Since then Kaminsky says he has always wanted to be a professional baseball player. “I feel almost every young kids ultimate dream is to be a major leaguer,” Kaminsky said. Kaminsky grew up in New Jersey where he attended St. Joseph, a catholic high school. He became the first Bergen County player taken directly out of high school in the first round of the Major League Baseball draft. Kaminsky says family has always played an essential part in his life. There have been other prominent figures who Kaminsky looks up to. One of his role models includes Derek Jeter. If Kaminsky was not playing baseball he says he would be doing something within baseball. 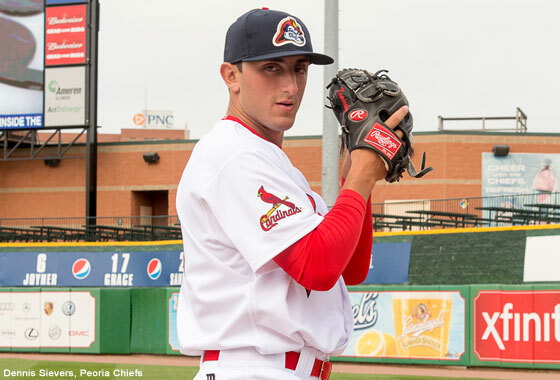 “Baseball is my passion and I couldn’t imagine doing something else,” Kaminsky said. When Kaminsky was drafted he says the moment was surreal. Kaminsky says the Cardinals always strive to do the right thing and have a very strong respect for the game of baseball. He gives a lot of credit to the Peoria Chiefs. This year was a great experience for him- meeting a lot of good people, getting coached by a lot of great coaches and ultimately learning a lot about the game of baseball. Kaminsky says you can expect him to work as hard as possible in the coming years and do all that he can to help this organization. His career goal is to be in the big leagues. Kaminsky hopes to have great long career and ultimately help the Cardinals win a World Series. “If there was one thing I’d want to be remembered for, it’d be always trying to do the right thing, regardless of the situation,” said Kaminsky.